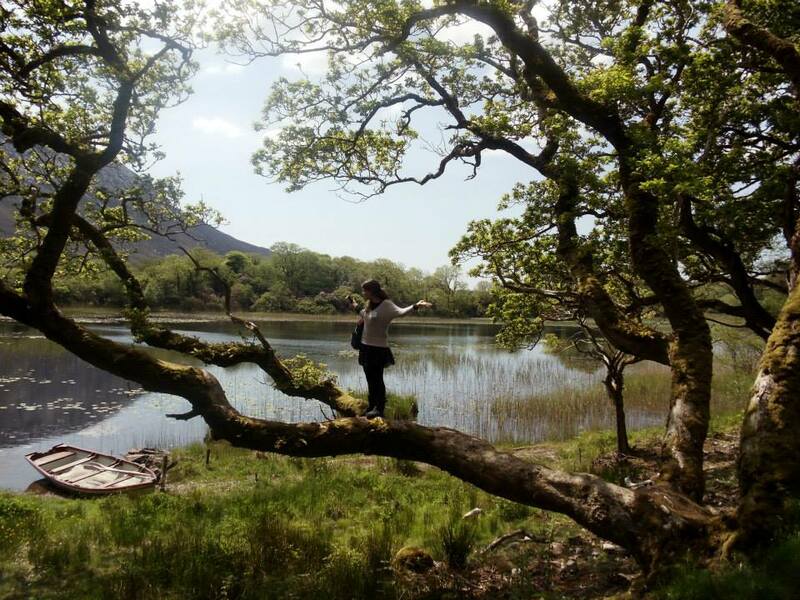 Standing on a strong branch while on study abroad in Ireland. My trip to Ireland was not just a check mark on a list of dreams, but many experiences I had that cause me to feel stronger today than I did last spring. One such experience began with a poetry workshop led by Ms. Geraldine, an established Irish writer. To start a group poem, she shared a beginning line and the person closest to her shared a second, and one by one, everyone added a line. Our group was fun and light-hearted, which meant that a poem beginning with the line ‘the bog water was thick’ ended with a line about a mermaid. At the end of the workshop, Ms. Geraldine invited everyone to write and share poems later at a poetry reading. Although it can be scary to share your thoughts and feelings, many people courageously did, which encouraged me to read my entire poem. I will never forget the beautiful support I saw on the faces of those listening. Another time I saw the same support, was when our group visited Clifden’s Pub. Besides a glass of wine I have had every once in a while when watching movies with my mom, I do not drink and neither does Samantha. Although we do not plan on drinking like fish when we legally can in the United States, we did follow the popular recommendation to have a drink or two in Ireland. Our new friend Mike was shocked we do not drink and interested in our reactions to the beer. Still, he did not stare at us. Supportively, he (and everyone else) let us sample in peace. That night we tried:  glass of Smithwick’s,  Screwdriver, and  Irish coffee. When we returned to the Abbey, we all tried to keep quiet, so as not to wake the nuns who had graciously welcomed us into their home. On one of the last days of our trip, Mother Maura talked to us about her community. The sisters try to help each other grow through inner and outer silence. Their reverence for silence is a reverence for listening and reflection, and was respected by my group. While making memories I will never forget in Ireland, I was learning how to better support myself and others. By taking time away from my cell phone, television, and other distractions, I allow myself to reflect and grow. By listening without interrupting Samantha, my mom, my dad, and my friends, I can better understand them and support their growth. As I returned from Ireland to Notre Dame, from one paradise to another, I was carried on the strong, sturdy shoulders of my motley, Kylemore crew.